What do you cook when your heart hurts? For us, for the last few weeks, it was a whole lot of comfort food. There was pasta, lots and lots of pasta, sauced with ragu, in skillet mac and cheese, and in Michael Ruhlman’s macaroni and beef with cheese (which is better than it has any right to be). There was chicken, pan fried and roasted, with one of those roasted birds serving to provide a very special last supper for our Kali. If you fill in the blanks, the dinners I didn’t photograph over the last few weeks, the other meals that were part of those days, you’d see a whole bunch of crap. If we could get ourselves to eat at all, it was mostly junk food, fatty, poorly fried, the kind of stuff you grab and choke down because you realize it’s 2:30 in the afternoon and you’ve been up since 5:45 and you haven’t had it in you to eat anything yet, but your hands are shaking and you can’t focus on work, and you don’t have time to take a proper break to get something reasonably healthy or good, to sit for a moment and eat mindfully, or because you’re feeling rough around the edges in the morning and need something akin to a “hangover breakfast,” all caffeine and questionable meat on a grease-sodden breakfast pastry (don’t forget the cheese). Weeks of eating too much rich food, of too many “one more glass”-es of wine, of the stress and the heartache Mike and I have been feeling of late have left us both in a sad state, feeling as bad physically as we have been emotionally, and this weekend, we thought long and hard about how to pull ourselves out of this rut and get back our equilibrium. We broke out our new pressure canner and put up a total of 20 pints of crushed tomatoes, locally grown and perfectly ripe, to nourish us during the winter. I’d never canned anything before, and Mike hadn’t been part of the process since he was a kid helping his family do it, and it was an absolutely thrilling, terrifying, wonderful project to tackle with my husband, a productive activity we took on together and loved, and a very welcome distraction from our grief. And we came up with a plan. Vegetables. 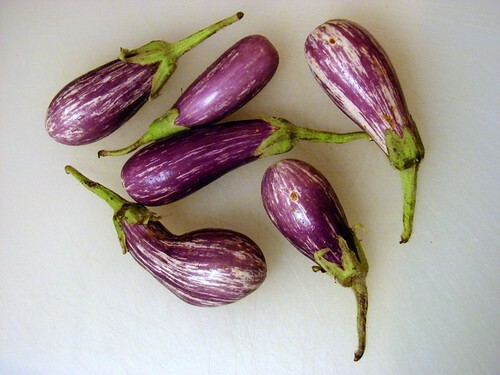 It’s harvest time, our farmers’ markets are teeming with produce, we just needed to plan, and buy, and cook. And eat. And we have, and we will continue to do so. 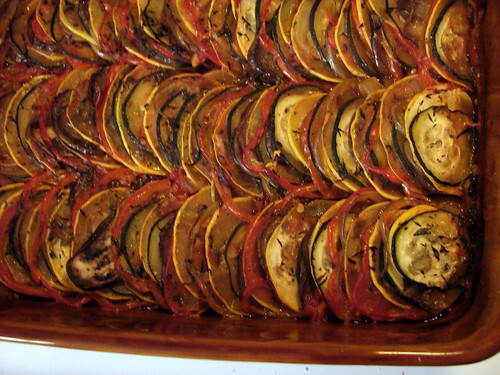 We started with an imperfect put delicious ratatouille, my loose interpretation of Deb’s interpretation of Remy’s/Keller’s, and imperfect as it was, it was so tasty and satisfying. It was a wonderful start. And now we have juices and whole grains and oily fishies and crisp apples and our favorite locally made yogurt, and the vegetables, the glorious vegetables to look forward to, and we’ll be healing our bellies, hearts, and souls with them for many weeks to come while we get our lives back into balance. And I hope to share it all with you in the days ahead. Thinking of you during this hard time. So glad you and Mike have each other, and hoping each day gets a little easier. Those veggies will help. I should follow your lead; it’s so easy to stop taking care of eating good meals when everything gets crazy. The enormity of your pain is equal to the amount of love you have given and received. You are right that we all know, going in, that we will outlive them, but that does not diminish the pain. Thank you for allowing us to share in your life, it is very special, and you have given so much to so many, not just your kitties. It’s so true that sometimes we all need a food detox. I am glad to see that you and Mike are taking care of yourselves and allowing your wounds to start to heal. What is the difference between canning with a large pot and a pressure canner? I’ve only used the large pot method and am curious. Thanks for continuing to share, Jen. 🙂 Hope the next few weeks are restorative! 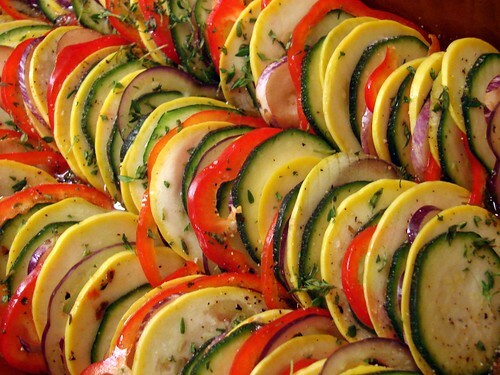 I knew at once that this was the ‘Ratatouille’ Ratatouille 🙂 Ber’ pretty. Pressure canning uses the pressure of steam to heat the interior of the canner to 240ºF; The bacterium that causes botulism can live in temperatures above 212º, so a boiling water bath won’t kill it. For low-acid foods, such as meat stocks, most vegetables, etc., this is vital because there’s not enough acid in the food to kill the bacteria. For high-acid foods such as tomatoes, this isn’t really important because the acid kills bacteria. So what’s the advantage of pressure-canning tomatoes, if it’s unnecessary from the standpoint of food safety? Time. Pressure canning shaves about 20 minutes off the process. Since we had to do this in two batches, it saved us probably 45 minutes. 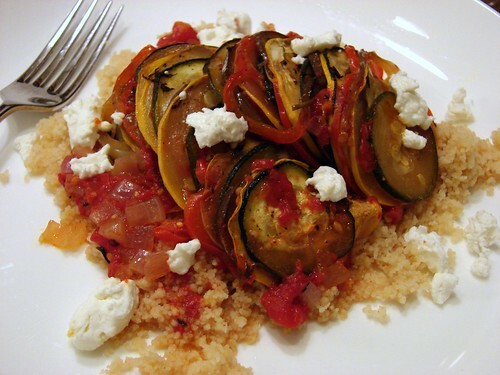 The ratatouille looks delicious. Perfect, in fact. Thanks for the inspiration, as always and thinking of you from over here. You found the perfect therapy! an absorbing project to work on together…and wonderfully healthful, too! your rows of jars full of red treasure will bring you so much pleasure during winter…just as one hopes memories of Kali will warm you as well. Its good that you have found away to soothe your heart. I rarely comment but I love your photographs and I keep you in my prayers. Beautiful post as always. I am so pleased that you were able to find some comfort and grounding in doing the canning project..I followed your tweets…:) Nourishing yourselves is cathardic and things will get better in the weeks to come, it is all still so raw for you both. Thanks so much, everyone. It’s so hard to believe that a week ago, right around this time, we were holding her as she passed. It *is* still very raw, but we’re trying hard to move forward. My Dad just passed and while I was home with Mom I made lots of easy to digest meals…. chicken and collard soup, linguine with shrimp and scallops, cereal…. grief is painful. Food doesn’t have to be. Our lovely mutt, Stella, just passed this year, also. That, for some odd reason was a bit more painful…. she lived with us. Oh, how quiet the home becomes when your beloved pet is gone. Sending you loads of love and comforting thoughts….